The Delta Ashton Single Handle Pull-Down is not just a faucet. It’s a technological wonder. Not only does the shiny, gooseneck-style faucet look beautiful and clean, but it also features Touch20® technology. That technology means that the entire handle and faucet are both touch-sensitive, turning on and off with a quick touch of a finger. The Ashton also includes several other technological advancements. Its TempSense LED will let you know what the temperature of the water is when you turn it on. It also has an internal mechanism that will automatically turn the water off for you, if you forget to do so for more than 4 minutes. So, you’ll never have to wonder if you left the water running. The Ashton’s pull-down sprayer head can be used to clean every inch of each pot and pan, as well as the sink itself. With the push of a button the water can be switched from a light to a more intense spray. The Ashton is battery-operated, although A/C adapters for it are also available. If you choose to run it on batteries, you will be happy to know that the batteries can last for years, and there is an indicator light to let you know when they need to be replaced. 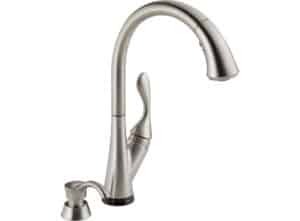 Click for more information on the Delta Ashton Single Handle Pull-Down Kitchen Faucet. Do you like the classic look of a sink with a lower faucet and a metallic finish? The Delta Foundations® Single Handle is a perfect faucet to blend in with a classic kitchen. It comes in either Brilliance® Stainless or chrome finishes, which means that it can be matched with any existing stainless steel or chrome sink and kitchen appliances for a nice, clean look. This classic faucet design comes with a sprayer on the side. Although it does not have a modern gooseneck-style spout, its spout can be rotated 360 degrees, allowing you to place even the largest pots and pans in your sink. You can then wash all of your dishes, placing the spout at whatever angle is convenient for you at the time. Meanwhile, the side sprayer can be used to clean the dishes and the entire sink, as needed. The hose also stretches enough that you can use it to fill containers in front of or next to your sink. The Delta Foundations® is installed using a 4-hole 8-inch installation. The simple design makes it easy for almost anyone with basic plumbing knowledge to install. So, if you enjoy do-it-yourself projects, it is an excellent choice. 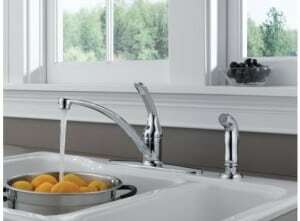 Click for more information on the Delta Foundations® Single Handle Kitchen Faucet.